were organized, there would be no need for art. We are easily located on Main Street (US Route 7) in Kent, CT, just south of the traffic light at the intersection of Route 7 and Route 341 about 100 yards. Look on the left if you are driving south, on the right if going north. Oct. 23rd to Nov. 5th (NEWS Show) -- open every day, Noon to 4 pm. Please see the calendar page for further details. Until 1956, the KAA held exhibitions wherever space was available in Kent. In that year the Association acquired a two-story colonial house on South Main Street (Route 7), and as time went by, architectural improvements were made to allow the entire interior to be converted into its present spacious well-lighted and air conditioned galleries. We take pride in our facility and exercise care to maintain and keep it in top-notch condition. Smoking is not permitted in the building. Parking is available in the designated parking area in the rear of the building. Inside the Gallery, you will find two stories of exhibition rooms as well as our office and friendly, helpful staff. In addition to the works exhibited on the walls of the rooms, all of which are for sale, there is a Portfolio gallery in the office offering unframed works by our members. 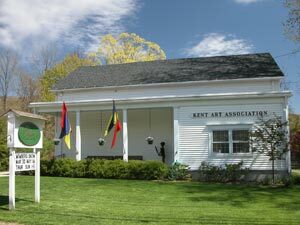 The Association will consider applications for exhibitions in its gallery by individuals or groups during times when there are no prior scheduled events. Rental of the KAA gallery is subject to certain terms and conditions which must be agreed upon prior to any exhibition taking place. A complete set of Gallery Rental Rules is available on request.